Today one if my close student has been promoted to Jûdan by Hatsumi sensei. Cédric (left on the picture) has been training for many years with me and has a very nice Dôjô near Paris. It is always a very special moment for a teacher when one of his or her student is reaching this high rank. The Jûdan rank is the first one of the high ranks, as you know the ranks above are all “jûdan plus an element”. We call them 11th, 12th ,13th,etc because it is easier to call them with numbers. But do you know that the real names for these ranks are linked to the five elements? The so-called “jûichi dan” is in fact a “jûdan chigyô Happô biken” where “chigyô” is the border at the limit of Chi and sui. And this goes like that until the last rank: suigyô, kagyô, fûgyô, kûgyô. Beginner to ikkyû is like kindergarten. Jûdan to “Jûgodan” is like University. Do you remember the first day you entered university and the way you felt? The world was yours wasn’t it? Then when you began to study for real, you increased your knowledge dramatically. The Bujinkan system is exactly the same. Your growing understanding of the art transforms you and prepares you gradually to be living on your own. 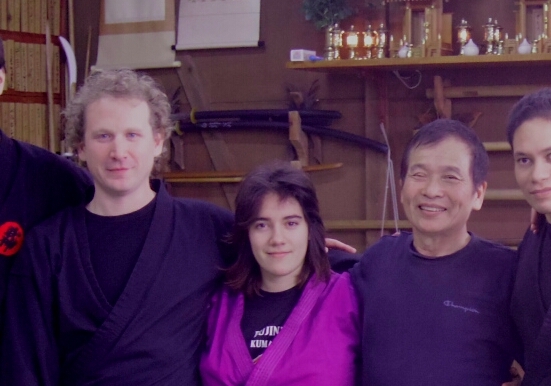 In fact the last Bujinkan rank is like a diploma of Engineer or Doctor. But like in real life, when you “graduate” from the Bujinkan University, you have only acquired the theoretical knowledge and you have no real life experience. The real work can then begin. The Jûdan is the first step to become a true practitioner. Good luck Cédric on this new path. And remember that I’m here if you need help or advice. Congratulations to Cédric. I had the great pleasure of training with him years ago at one of your seminars and then we all went to the Chinese restaurant. A true gentleman and passionate budoka !! !